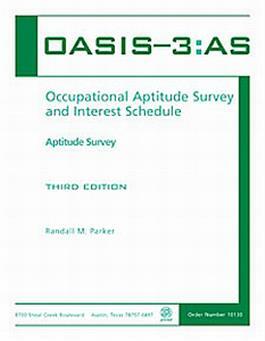 The Occupational Aptitude Survey and Interest Schedule-Third Edition (OASIS-3) consists of two related tests: the OASIS-3 Aptitude Survey and the OASIS-3 Interest Schedule. The tests were normed on the same national sample of 2,005 individuals from 20 states. Teachers, counselors, and other professionals can easily use the OASIS-3 to assist in the career development of students in Grades 8 through 12 and adults. The OASIS-3 can be administered individually or in groups. Each test takes from 30 to 45 minutes to administer and can be hand scored or machine scored. Aptitude SurveyThe OASIS-3 Aptitude Survey measures six broad aptitude factors that are directly related to skills and abilities required in more than 20,000 jobs listed in the Dictionary of Occupational Titles. The Aptitude Survey yields six scores: General Ability, Verbal Aptitude, Numerical Aptitude, Spatial Aptitude, Perceptual Aptitude, and Manual Dexterity. Validity coefficients with similar subtests of the General Aptitude Battery range from .60 to .80. Median alpha reliabilities range from .70 to .91. Each Aptitude Survey kit can test up to 50 students in groups of 10. Interest ScheduleThe OASIS-3 Interest Schedule measures 12 interest factors directly related to the occupations listed in the Guide of Occupational Exploration. The factors are Artistic, Scientific, Nature, Protective, Mechanical, Industrial, Business Detail, Selling, Accommodating, Humanitarian, Leading-Influencing, and Physical Performing. The Interest Schedule contains 240 items scored as Like, Neutral, or Dislike. Alpha reliabilities range from .83 to .96. Construct validity was determined through principal components analysis and empirical research. OASIS-3 Interpretation Workbook AvailableThis workbook was developed to help students understand their OASIS-3 aptitude and interest scores and help them find specific job titles they should consider in career planning. By using this self-administered workbook, students systematically match their aptitudes and interests to approximately 200 jobs carefully selected from 2,500 jobs that constitute 95% of the U.S. workforce. The selected jobs span all 12 vocational-interest factors and represent low to high levels of vocational aptitudes. A bibliography of career planning resources, including Web sites, is also included. OASIS-3 Machine Scoring ServicePRO-ED now offers a free machine scoring service for customers who purchase the OASIS machine-scorable answer sheets. Return the completed Aptitude Survey or Interest Schedule scannable answer sheets to PRO-ED for scoring. Customers will receive a profile of raw scores and standard scores using the appropriate norms. NOTE: Further instructions are contained in each package of 10 answer sheets.